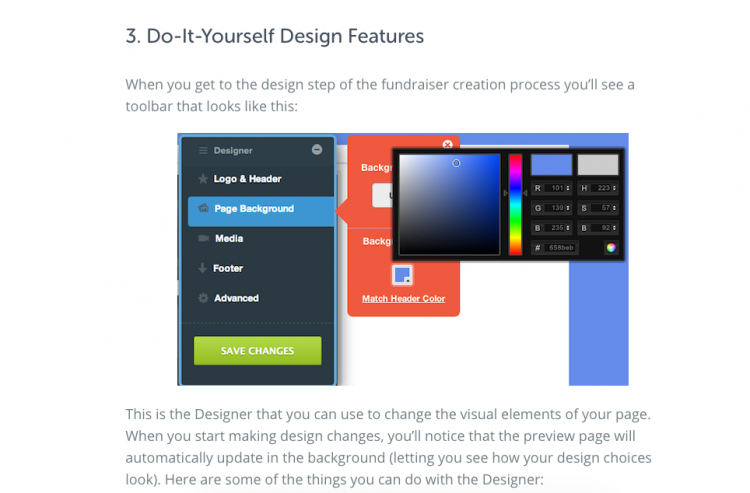 There are too many new customization and design features in the new Fundraising Suite to mention in one blog post. A side-to-side comparison makes for an easy analysis though. An excerpt of the blog post announcing StayClassy’s new design features four years ago. That announcement marked the beginning of an all-in-one fundraising suite enabling organizations to create branded peer-to-peer, event, or donation pages. For the time, it was an exciting development and a welcome improvement to bland and generic donate buttons. But four years is a long time in the digital age. The design and storytelling standards supporters expect shift dramatically year-to-year. We wrote about the new Fundraising Suite for the first time in March, but it wasn’t mentioned by name. It was simply a short post about an ambition to make campaign customization easy and accessible for any organization. An excerpt of Classy’s blog post announcing the new Crowdfunding design tools in early 2016. When we released Crowdfunding in May, we billed the event as the “beginning” of a larger project to reimagine every campaign type on Classy. Crowdfunding established a solid foundation of new code and customization capabilities, allowing the product team to move forward with Classy’s most used campaign type, peer-to-peer. Last week we announced the new Peer-to-Peer campaign as an opportunity to design your movement. Beyond customizing everything from header opacity to page layout to breathtaking images, the new Peer-to-Peer campaign marks the arrival of a new Fundraising Suite that tackles common nonprofit challenges familiar to small and large organizations alike.